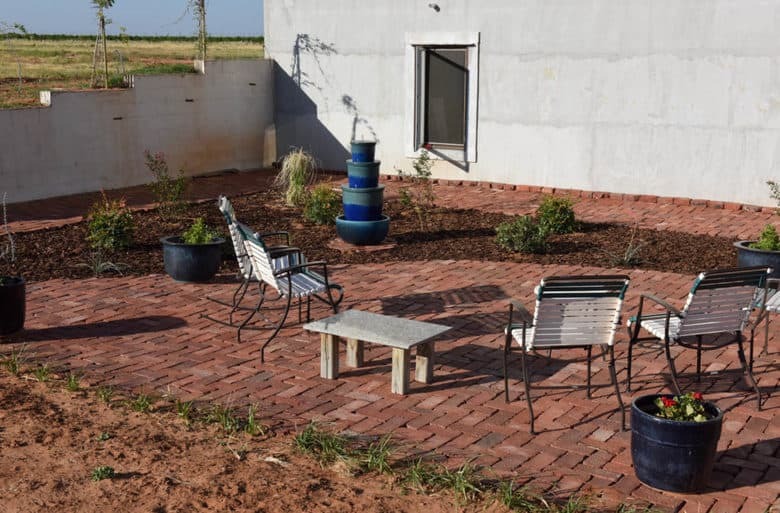 Home » DIY Brick Patio – How to Make Your Own! 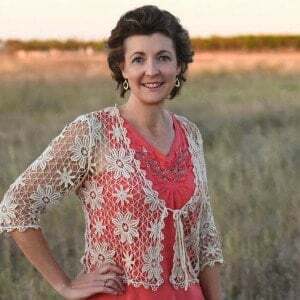 DIY Brick Patio – How to Make Your Own! Do you like the look of a brick patio but the cost is prohibitive? 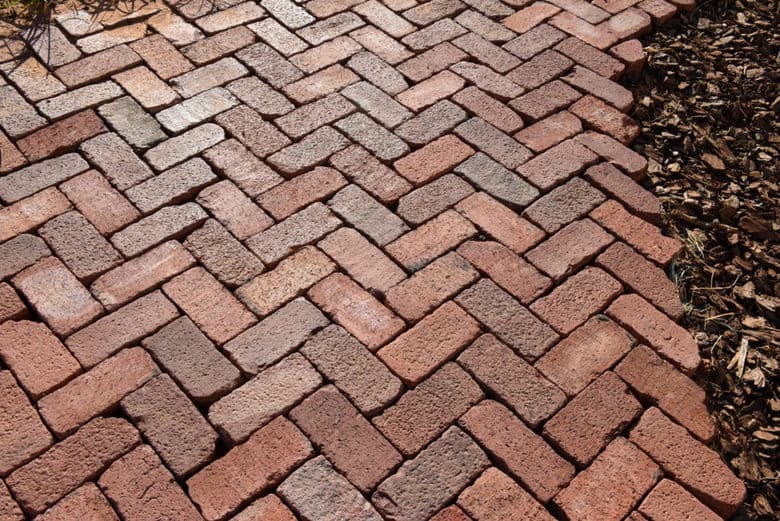 Try a DIY Brick Patio! I am really excited about how well ours turned out and even though it has been finished for such a short time, we are enjoying it. 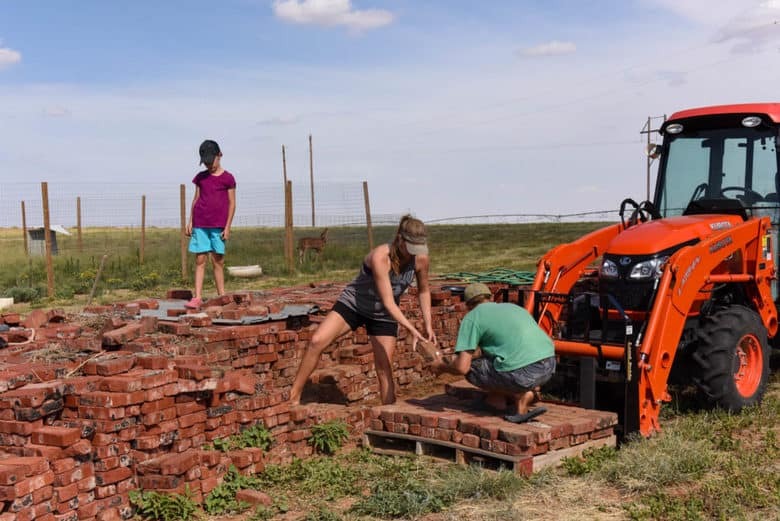 Our diy brick patio was done using free bricks – I’ll tell you how we got them in a minute, as well as, the final cost of the project. As you may know, we are living in what will eventually be our basement. 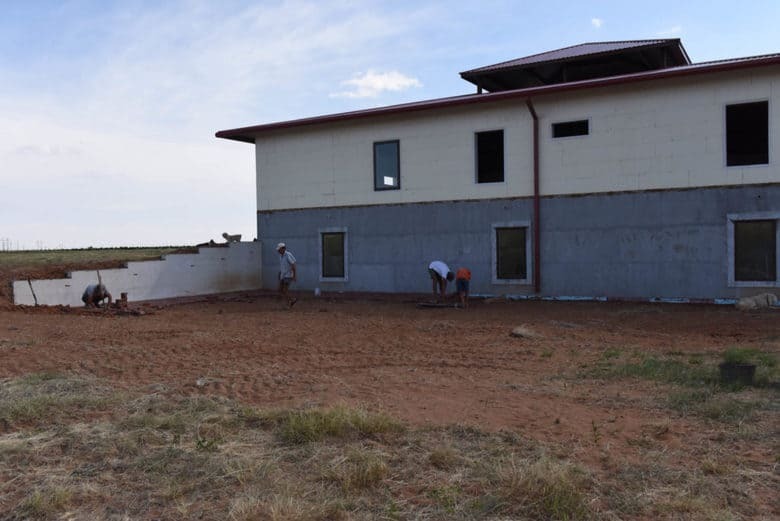 After grape harvest this past year, we added the walls and roof to the upstairs along with some of the windows and, it looks great – for an unfinished house! I know we are finishing it as money and time permit but, sometimes, I get impatient and tired of living in what looks like a construction site! So, we have done some landscaping in the backyard by making a diy brick patio complete with fountain and plants. Look at what we started with! The small town near us had taken up some brick roads and the bricks were free! For free bricks in your area, try calling the chamber of commerce for different towns (especially smaller ones) that might be improving their roads. Before you start calling, there was a catch – we had to pick them up! This is one of those times when I use “we” loosely! John and the boys picked them up but I was waiting with cold drinks when they returned! 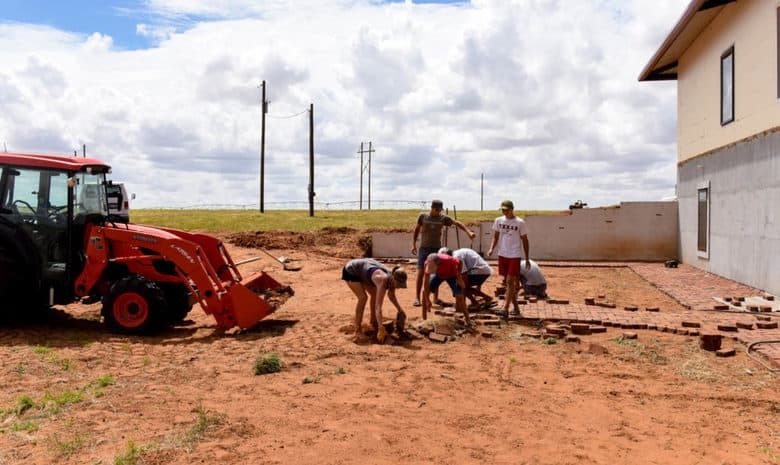 And, because of liability, you were not allowed to climb on the brick pile, they could not load your trailer with their tractor and you could not bring your own tractor. Each brick had to be loaded by hand onto our trailer and then unloaded at home. I think all total, six loads were gotten, all with the plan to brick our drive. 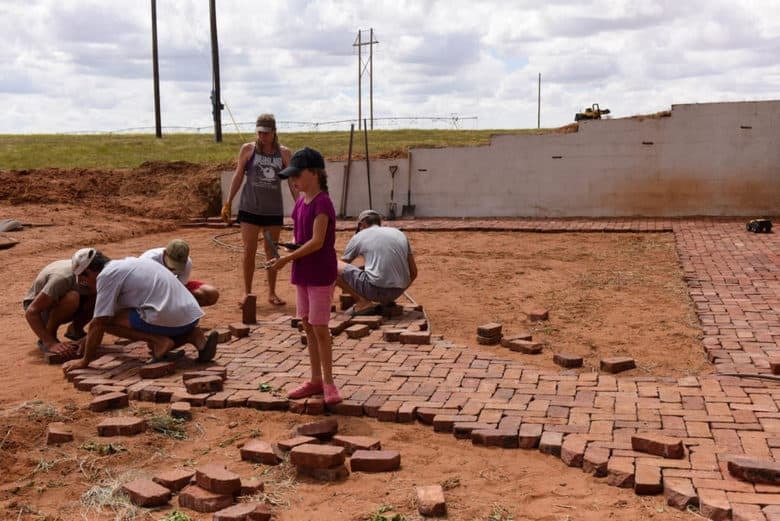 We still plan to do that but first, the diy brick patio! You can Google and find lots of ideas for brick patterns and get as intricate as you want. After playing with patterns, we settled on a herringbone pattern. We worked in sections leveling the dirt as we went. If you plan to make a diy brick patio, take the time to level the surface. If you don’t, you will end up with ripples and dips where the ground is uneven and it really shows the imperfections! Yes, this is a voice of experience talking. While playing with patterns, the boys and I didn’t bother leveling the ground and I can tell you, leveling is worth the time it takes! To level, we used a long board to scrape the high spots off the surface and filled in low spots as we went. The first day, we used a pallet on our tractor forks to transfer bricks from the brick pile to the patio area. Boy, was that a lot of work! The second day, we used the tractor and scooped up a load of bricks and carried them to the site. It went much faster! 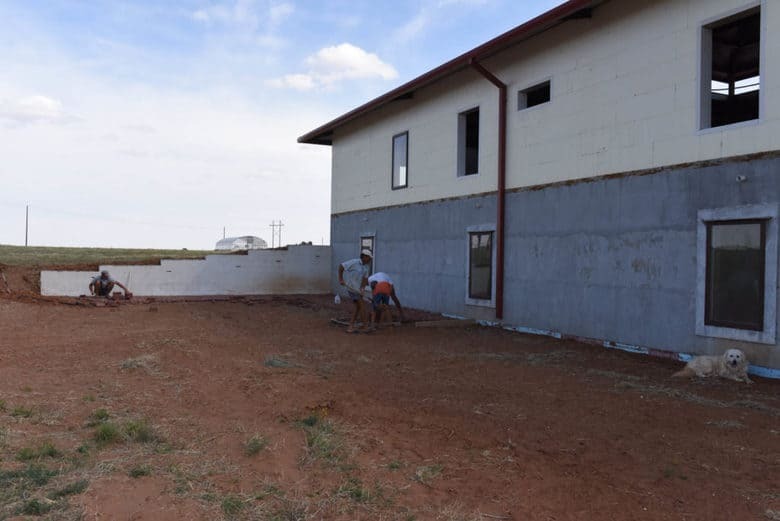 You can see the work progress from the 5 ft walkway around the back of the house and along the wall to the beginning of the patio area. And, finally, the finished patio area. Wisteria is planted on top of the wall with the idea that it will drape down providing a backdrop of color. The DIY water fountain which we made is surrounded by shrubbery which should do well in our area. With our high winds, I only purchased plants appropriate for our growing zone. I already had the pots and most of the plants in them were grown from seeds. The liriope surrounding the brick patio area will grow and fill in the spaces. I think one of the hardest parts is waiting for the plants to grow and mature. 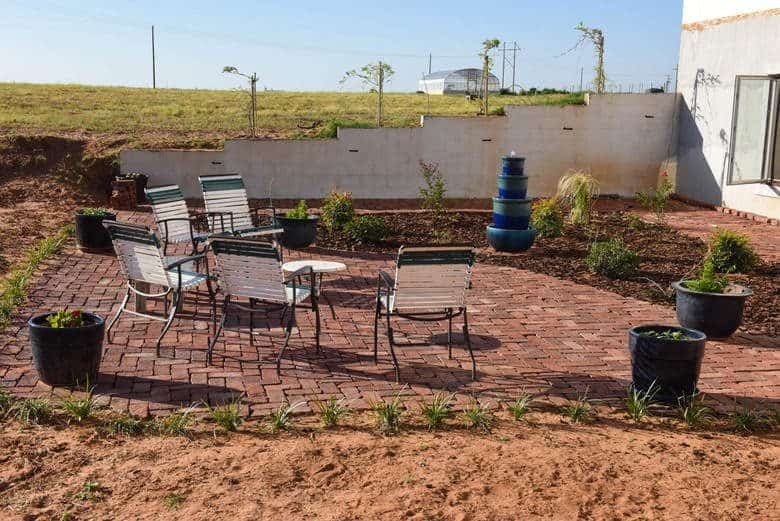 Since I was able to get many of the plants on clearance and the bricks were free, our diy brick patio was very economical – the project cost $249.00! We are thoroughly enjoying sitting outside every evening and even had friends over last night to enjoy it with us. Next on the agenda is planting grass all around the patio. Since we have patches of Bermuda grass growing like weeds in the vineyard, we plan to dig it up and sod the area – I love freebies! For instructions on making your own fountain, see How to Make Your Own Water Fountain. It it’s such a pleasure to watch as your progress continues in your world. We have done so much with homes as our lives matured and so understand your desires and pleasures with the work. I always look forward to your emails. Charlotte, thank you for taking the time to comment – I appreciate your encouragment!